Animal skins, rocket launchers and coconut bikinis... Stephen Bailey goes in search of his next destination at the world’s largest consumer travel show. The author meets the towering Miss World finalist. With her hair tied in cute pigtails, a Swiss woman serves up a plate of soft cheese. Behind her, a large cable car stands amid posters of snowy mountains. Twenty minutes ago, I was drinking coffee in Colombia. I’ve already been transfixed by Mexican dancers, Brazilian footballers and the Ivory Coast’s version of a chocolate fountain. Swiss cheese tastes good but I’m already walking off, passing through Austria on my way to Slovakia. In just one hour I’ve seen 20 countries, so let me explain. This is the world’s largest consumer travel show. 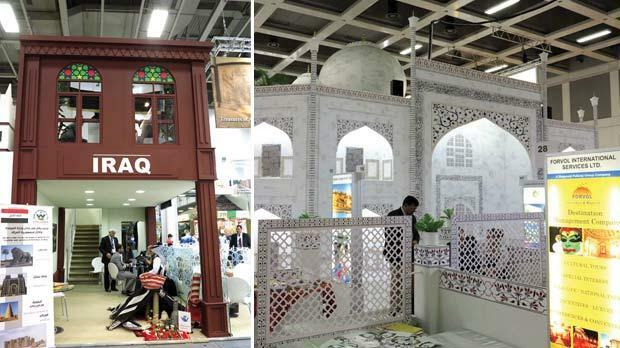 Spread over 30 conference halls in Berlin, every country has its own area, showcasing its nation to visitors at the annual ITB show in Berlin. Tourism board slogans cover walls: like ‘I FEEL sLOVEnia’, and simply ‘Sensational’ (Brazil). Some countries opt for the tried and tested approach of dressing up beautiful local women in traditional clothes, a tactic that lured me to Tahiti. Others use the free-sample method, offering out local delicacies and then bombarding people with brochures and flyers. Poland lets you play volleyball, while Brazil lets you take a virtual penalty in any of the World Cup stadiums (a little unrealistic given that they’re not actually finished...). So much catches the eye that I’m wandering randomly between continents. My aim is to tour the show and select my next holiday destination. Right now I’m bored with the sales pitch about some rural Romanian province, so I pick up the pace, casting Germany and Spain aside and finding myself under the monumental lights of Las Vegas. That sounds a little violent for my next holiday, but how about Iraq? Seriously? I’m being offered four-star hotels in Baghdad and tours to great cultural sites that have nothing to do with oil or suicide bombings. Iran is similarly dismissive of any preconceptions of danger and foreigners not being welcomed. The organisers seem to have pulled a huge joke on the Iranians. Next to the Welcome to the Islamic Republic of Iran sign is the biggest bar at the conference. I stop for a warsteinner while flicking through a brochure on the wonders of Persia. Pakistan, Turkmenistan, Uzbekistan and Eritrea... the list of strange holiday destinations continues. Now I’m gazing at a monumental poster of beach paradise. The Seychelles certainly look appealing and the two brunettes in coconut bikinis have created a brief blockage of stunned consumers. Sun, sand, palm trees and a dozen opulent hotels to choose from; perhaps I should visit the Seychelles? Across the path is an almost identical poster. It’s the Maldives, and on closer inspection, I discover I’m on a tour of random tropical islands. Beautiful it may be, but there seems to be a lack of originality here. It looks mundane given that I’ve just come from Bangladesh. That’s the problem with beach destinations – they’re just so preoccupied by sand. I need to find the right balance somewhere – a mix of beauty and adventure without the need to double travel insurance premiums. Fuelled by free Polish pastries and Ethiopian coffee, I’m charging through the halls, dismissing countries with the flimsiest of rationale. Latvia looks too green, the Czech Republic is nothing but historic churches and Jordan has an almost spooky facade. Then I see it. Shining brilliantly at the end of a hall is a huge replica of the Taj Mahal, white towers and dome somehow resplendent under harsh, incandescent lighting. It might only be six or so metres high but I’m already sold. I’m not the only one. Walking through the Taj – yes walking through the palace – are hundreds of equally awestruck people. So where can I book my flights to India? Nowhere, it seems. With so much traffic to entertain, the Indian delegation has retreated into the anonymity of a private room. They look away on eye contact and ignore all my pleas for help. Such a sharp contrast to earlier on in the day, when I sat in a traditional straw hut from Burundi and was given my choice of animal skin to lounge on. Someone from the Burundi government had personally written down direct flights on offer from Europe. Ruffled and weary, I’ve decided adamantly that India will be the last place for my next holiday. A great destination must also be helpful and welcoming. Yet, nothing I see can compete with this majestic replica. The flamboyance of Dubai’s 22nd century arena doesn’t impress me. Burundi is so small that I can’t find it again. Seeking solace, I spend 30 minutes aimlessly searching for Malta but also can’t find it. Bewildered and battered, I find a break in the crowds, sit on the carpet and close my eyes. The conference is on such a scale that it’s somehow turning me away from tourism. Through the hum of chatter comes cackling laughter, then shouts that gradually intensify. A large, black woman is summoning me: “Why you over there on the outside? Come on the inside,” she chuckles. Once I had sat beside her, the woman continues to offer a hearty laugh with every shouted sentence. “If you come to our country, you’ll find many women who look like her.” Like? Gazing up from a cup of sweet coffee, I see a woman towering over me. She must be close to two metres tall and her appearance causes me to slur and stutter. 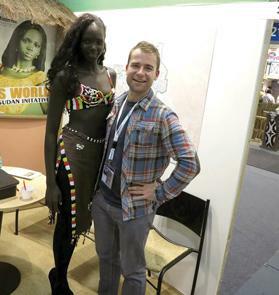 “She has just arrived from the Miss World finals,” I’m told, as we pose for photos. Where do I sign up for this place? Refreshments flood the table and four delegates introduce themselves. They’re not the least bit interested in selling. They just make humorous conversation about the travel show. They don’t even have flyers, the promotional material having a home-printed look. They’re beautiful, welcoming, funny and charmingly genuine. There’s no going back now. I look up and see the country name. Forget the travel insurance premiums. Next year I will be going to South Sudan.